The Carpathian Mountains or Carpathians for short are a huge range of mountains forming an arc of roughly 1,500 km across Central and Eastern Europe. As such, they form the largest mountain range in Europe. The mountain ranges stretch in an arc from the Czech Republic in the northwest to Slovakia, Ukraine and Romania in the east, to the Iron Danube River between Romania and Serbia in the south. The Carpathian chain is usually divided into three major parts: the Western Carpathians (Czech Republic, Poland, Slovakia, Hungary), the Eastern Carpathians (Southeastern Poland, Eastern Slovakia, Ukraine, Romania) and the Southern Carpathians, Romania and Serbia. In this extensive area, there are numerous fossil sites representing different geological ages. What is said to be the world’s most inaccessible human fossil site is in the foothills of Romania’s Carpathian Mountains. From data gained, scientists hope to wrap up their case for answers to some of the most hotly debated questions about early humans: "Did early modern humans make love or war with Neanderthals"? Were Neanderthals intellectually inferior to us? Some anthropologists believe Neandertalswere were not inferior and interbred with us. Other anthropologists examining the fossils think not. Near Rowe, Poland, exceptionally preserved Oligocene fish fossils are found, some of which are shown below. The Ukrainian Carpathian Mountains lie on the border of the East European Platform and the Mediterranean Geosynclinal Province. Their geological structure is the result of successive periods of sedimentation, orogenesis, and denudation. The basic pattern in the structure of the Ukrainian Carpathians is their distinct division into longitudinal structural-lithological zones. The mountains were principally formed in the Tertiary period and, therefore, Cretaceous and Lower Tertiary rock formations are most widespread in the Carpathians. 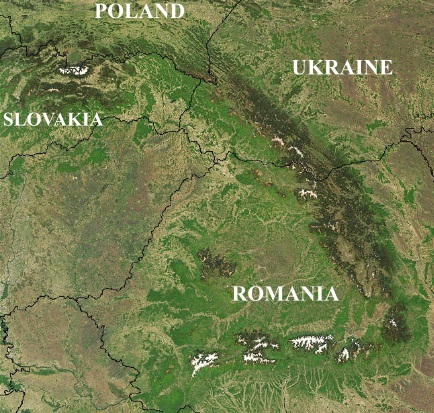 The Carpathian Mountains were formed during the Alpine orogeny in the Tertiary period. Prior to that, from the end of the Paleozoic to the Cretaceous period, mountains of the Hercynian orogeny (late Paleozoic era), known as the Protocarpathians, existed in their place. In the Cretaceous and Lower Tertiary periods the Protocarpathians were destroyed and were replaced by geosynclinal depressions filled with seawaters.